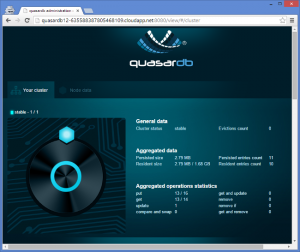 A quasardb Virtual Machine (VM) image is now available for free on VM Depot. It includes a free license limited to one node and everything you need to test quasardb. Deploying the virtual machine is very straightforward and take about 15 minutes. Type "quasardb" in the search box. If it's the first time you use VM Depot, it will ask you to link your account with your Azure subscription. If you don't have an Azure subscription, there is a "Free Trial" for one month. See Python API documentation for more detail. See PHP API documentation for more detail. $ javac /usr/local/share/qdb/example/java/QuasardbExample.java -d .
See Java API documentation for more detail. See C API documentation for more detail. From the whole quasardb team, thanks for trying our product.